Students from Bath High School’s National Honor Society and Student Council were joined by representatives from the United Dairy Industry of Michigan, the Michigan Department of Agriculture and Rural Development, and the Food Bank Council of Michigan to celebrate a successful ‘milk drive’ to raise funds to purchase milk for Flint families. The Fuel For Flint fundraiser took place April 27 – May 11, and raised over $3,400, with donations still coming in. The total amount raised will be matched by UDIM and donated to Flint families through the Food Bank Council of Michigan’s member foodbank, the Food Bank of Eastern Michigan, located in Flint. Flint residents are encouraged to eat a healthy diet rich in calcium, vitamin C and iron to help reduce lead absorption. The Food Bank of Eastern Michigan will use the funds raised through Bath’s fundraising effort and additional funds raised through the website, FlintMilk.org, to purchase milk for Flint families served by the food bank. Some of the activities included selling milk jug contribution tags; hosting photo booths and hat days at the schools; visiting the elementary and middle schools wearing cow, cheese and milk costumes to engage younger students; and setting up donation tables at home sporting events. 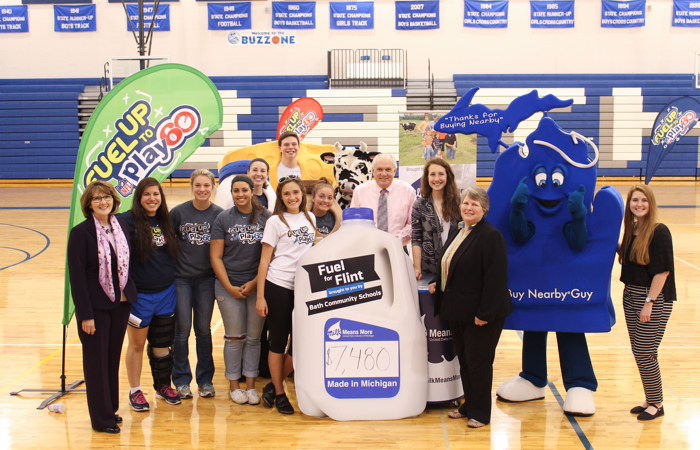 The milk drive ended with the a relay race featuring dairy ‘mascots’ and Bath High School students, to highlight the importance of good nutrition and physical activity. Area businesses, including the Bath Beehive Childcare Center, Spagnuolo’s Party Store, the Bath Township Police and Fire Stations, and the Bath Township Library, promoted the milk drive and collected donations at their sites. Highlights of the fundraising activities were shared via social media under #FuelForFlint. Bath High School is a participating school in Fuel Up to Play 60, an in-school nutrition and physical activity program that empowers young people to develop and implement strategies for increasing access to and consumption of healthy food choices. ‘Fuel Up Your Community’ Healthy Eating Play, with a focus on hunger, provides students the opportunity to engage their communities in Fuel Up to Play 60. Raising donations for milk will benefit the Flint community and increases awareness of those in need. In the coming months, more organizations, athletes and others will be recruited to support FlintMilk.org, helping to raise awareness of the community’s nutrition needs and keeping the cause in the spotlight. To donate or to coordinate a milk drive in your community, visitwww.FlintMilk.org.